How to Uninstall Bitdefender? Download Removal / Uninstall Tool. 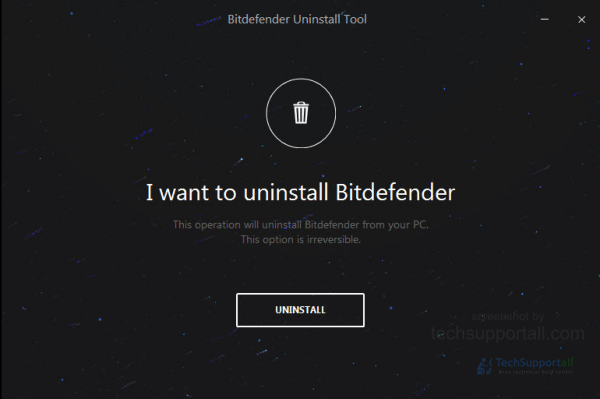 Removing or uninstalling a Bitdefender product from the computer is an easy process. You can simply uninstall it from add / remove programs from the control panel. But some times this process does not remove all the traces of the installation. In this case Bitdefender removal tool can help for a complete removal of Bitdefender product. Because antivirus requires a deep installation to protect computer from virus attacks, So uninstalling it from add / remove programs does not remove it completely. It may leave some registry entries or files. Bitdefender have provided official removal tools to remove its products completely from the system. This tool is compatible with Windows 10, 8, 7, XP etc and for both 32 bit and 64 bit versions. This tool is helpful in solving many issues related to re-installation and license activation. This may also eliminate compatibility issues when you try to install another security software product of Bitdefender or some other company. How to uninstall / remove Bitdefender? Simply go to the bitdefender uninstall link. On this page select the right type of product. Select if you have a trial product or is a paid product or you have a business product. On the next page you have to choose the right product name. And download the related removal utility. Please note different version have different uninstall tool like for 2019, 2018, 2017 etc. So choose properly. Run the downloaded file. and an uninstaller windows like below will appear. Click on the uninstall button. After completion of the process it will ask you to Close or Restart. Choose the restart button. And it will restart the system to complete the removal process. Please tell your experience using the below comments section. “A problem has occured in BitDefender Threat Scanner. A file containing error information has been created at C:\Windows\TEMP\BitDefender Threat Scanner.dmp” I never had BitDefender on this computer. I need to get rid of it. Hi John, Please try to scan with it again after cleaning temp folder (junk files). It should work this time. Let us know if doesn’t work. I used CCleaner before running The NEW Bitdefender uninstall Tool on two consecutive mornings to no avail. The tool doesn’t even stop the process. I am watching it run in task manager as tool is sweeping through numerous times. Result: Uninstall finished with errors. These are: Executing additional tools; Delete main registery keys ; Delete remaining registry values. You should try Revo uninstaller tool to remove any software which is having problem uninstalling. Simply start your computer in safemode and then uninstall all the security programs (Antivirus). This type of issue occurs due to two security get installed in a computer. Two security doesn’t work properly into a computer. Please let us know if we can help you more.